Don’t let your prawn farm profits fly away! Every day a single hungry Cormorant will eat 30-40 or more prawn. Left unchecked a flock of hungry Cormorant can quickly result in substantial farm loses. Solar panel powered and using a daylight photo eye to activate a digital sound recording the Scarecrow – Cormorant Deterrent is designed to automatically broadcast the sounds of predatory orca through underwater speaker(s) to stop birds diving the prawn or shrimp pond for food. Each Scarecrow –Cormorant Deterrent will operate 1 or 2 underwater speakers with the required 12 volt DC power supplied from either a 50 or 100-watt solar panel. 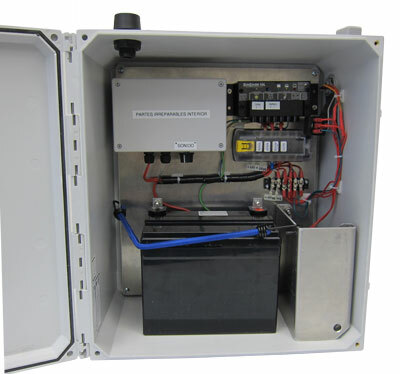 The IP65 rated outdoor enclosure is prewired with a voltage regulator that incorporates automatic low voltage shutoff to ensure best battery charge and maximum battery operating life. Additional attention to detail includes enclosure mounted cable strain relief fittings for sealed power and speaker wire entry, clearly marked screw terminals for wire connections, as well as full inline fuse protection of all system components. Operator adjustments include a volume control knob managing sound output levels for the chosen 1 or 2 underwater speakers as well as full adjustment to the daylight photo eye used to set automatic daylight start and dusk stop times. Position the Scarecrow – Cormorant Deterrent at the junction of two ponds for sound management control of 2 underwater speakers. Self-contained solar panel power generation eliminates expensive and time consuming farm site wiring for power. A quick 2 or 3 wire connection requires minimum time and no special training to install. Position the Scarecrow – Cormorant Deterrent where ever it will work best with ground, float, or pole mounting options. 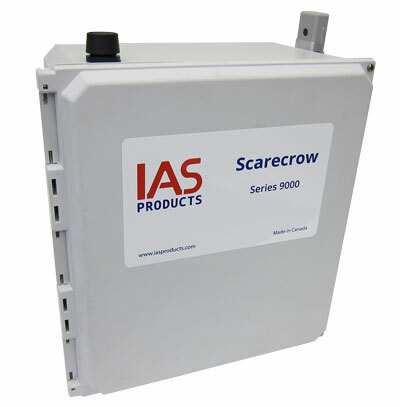 Each Scarecrow – Cormorant Deterrent incorporates solar power management. Overcharge voltage regulation and automatic low voltage shut off protects and maximises battery operating life. Inline fuses provide protection of all major components. Digital/solid state orca sound recording provides over 100,000 hrs/ 20+ years operation. Automatically transmit underwater orca sounds throughout the day to stop the loss of prawn and farm profits to birds.